Make the sauce In a small saucepan of boiling water, cook the peas until tender, about 1 minute, drain well. In a blender, puree the peas with the olive oil, buttermilk, 2 tablespoons of the lemon juice, the mint and shallot until very smooth. Strain through a fine sieve, pressing on the solids; discard the solids. Season with kosher salt, pepper and more lemon juice, if needed. Refrigerate until ready to serve. Make the fish Light a grill or preheat a grill pan. 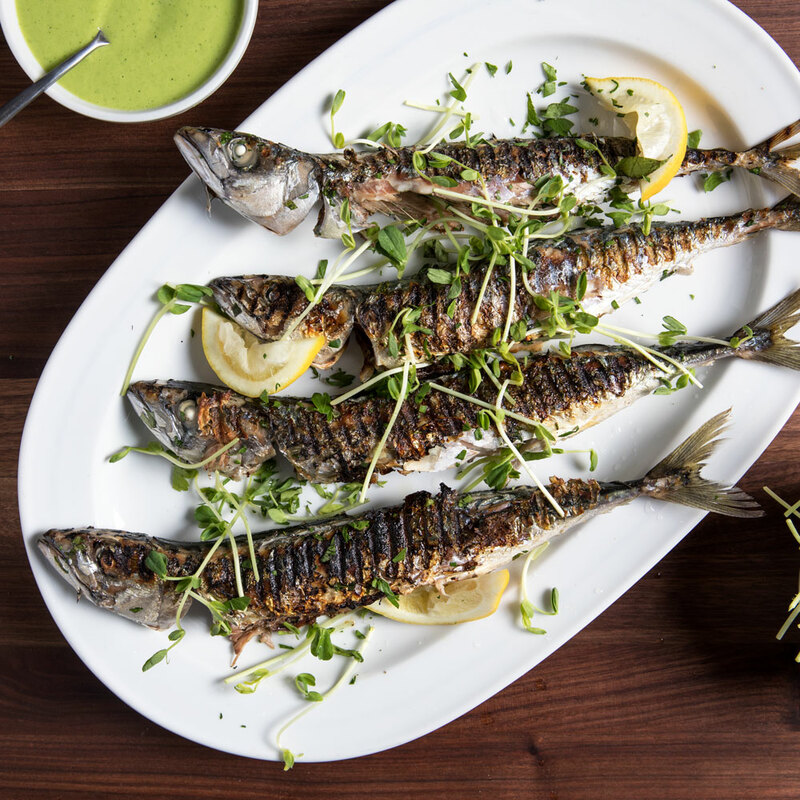 In a large bowl, gently toss the herring with 2 tablespoons of the olive oil, the parsley and tarragon and season with sea salt, black pepper and crushed red pepper. Grill the fish over moderately high heat, turning once, until just opaque, about 2 minutes per side. Transfer to a platter. In a small bowl, combine the pea shoots with the lemon juice and remaining 1 teaspoon of olive oil and toss to coat. Spoon some of the sauce onto plates. Top with the fish and pea shoots. Season with sea salt and serve. Pass the remaining sauce at the table. Review Body: In this dish it's all about seasoning.